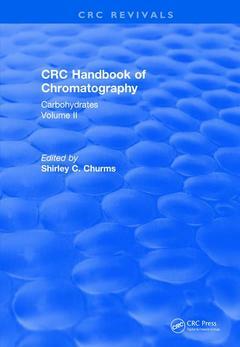 CRC Handbook of Chromatography: Carbohydrates, Volume II updates the first volume, continuing coverage of literature published from 1979 to 1989. Tabulated for easy reference and thoroughly documented, it presents the comprehensive data for all chromatographic techniques applicable to carbohydrates. It features glycoproteins, proteoglycans, and glycolipids, as well as mono-, oligo-, and polysaccharides. This important text emphasizes novel chromatographic methods. Highlights of this superb work include the diversity of HPLC methods applicable to carbohydrates, and the use of some new techniques, including supercritical fluid chromatography and ion chromatography in carbohydrate analysis. Readers discover the latest detection methods, degradative processes, and derivatization techniques. Detailed chapters cover topics such as spectroscopic techniques, electrochemistry, and gas chromatography. This easy-to-use volume provides an excellent working manual and reference book for researchers in the fields of carbohydrate chemistry and biochemistry. CRC Handbook of Chromatography, Carbohydrates: Volume II is an absolute must for all analysts working for industries concerned with carbohydrates.